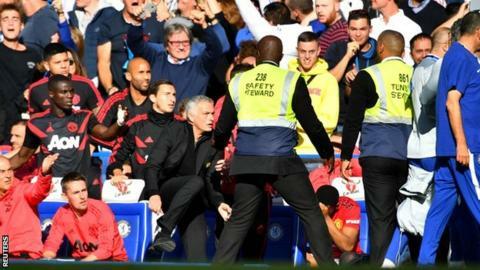 The incident occurred when Ianni celebrated Chelsea's 96th-minute equaliser in front of the United bench, sparking a retaliation from Mourinho. The FA said the Portuguese manager had been "formally reminded of his responsibilities" after the 2-2 draw. An FA spokesperson added: "Both clubs have received similar official reminders in terms of the behaviour expected of their staff and players at all times whilst in the technical area." On Monday, Mourinho said Ianni had apologised to him and "deserves a second chance". "I want to thank Chelsea and [Maurizio Sarri]," Mourinho said. "The young boy does not deserve more than what he got. "He apologised to me. He deserves a second chance - he doesn't deserve to be sacked. He went through a situation where he recognises he was wrong. "I hope everybody does the same as I did and do not disturb the career of a great guy. Probably someone with great potential. I'm not happy at all with more than that."